The "Holy Toledo! 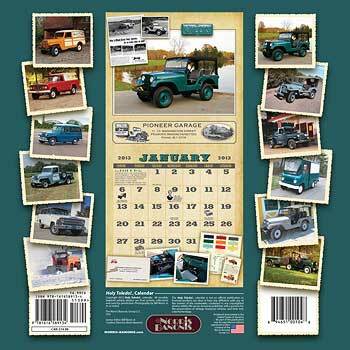 Slot-Grille Classics" calendar is back again for 2013. 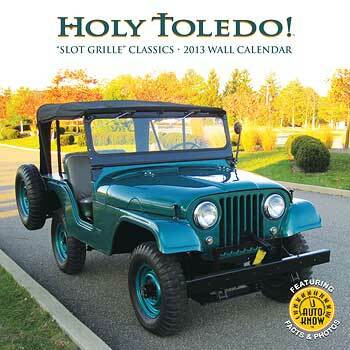 If you've bought one of these calendars during the past six years, you know that it's a year's worth of entertainment and information, but you won't believe that they've come up with yet another twelve head-turning Jeeps for the big color photos. For readers of CJ3B.info, there will be a few "Oh yeah, I remember that!" moments, but there will be even more "Holy cow!" moments. The photo of Scott Strudwick's 1953 Willys pickup in front of a restored 1940's gas station in Sturgeon Lake, Minnesota is stunning. Robert Rinsky's FJ-3A Fleetvan which carried the laundry from a Catholic girls' school in Toledo, is like a time machine. I appreciate the fact that publishers Bill Norris and Kevin Banonis always manage to find a nice photo in the snow for the December page, and this year's homemade Forward Control snowblower is an interesting vehicle, although a bit outside of the usual range of near-perfect, near-stock Jeeps. A "wow" moment for me was Frank Sanborn's 1964 J200 Gladiator on the August page. We've featured it more than once here on CJ3B.info (see Mini-Tonka Does the Full-Size-Jeep) but I hadn't seen his original Whitco convertible pickup top. Also available online again this year is "Broken Down Heroes," with twelve months of Bob Christy's black & white photographs of old abandoned vehicles, and "Classic Fire Apparatus" (right.) 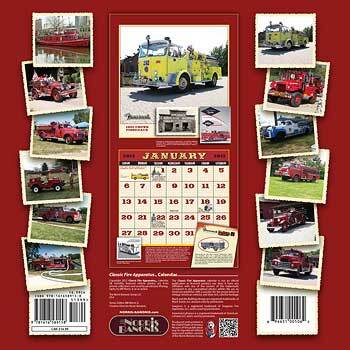 Judging from the back cover of the fire calendar, the trucks (and boat) included are indeed classics, including the Howe CJ-3B Jeep Fire Engine originally restored by Jim and Kristi Rorah and owned since 2010 by Mark Ciaglia. All three calendars are available online or by mail, $13.99 US each, plus $6 shipping in the US, $7 to Canada, or $12 overseas. You can save on shipping if you order more than one. Also contact Norris-Banonis if you're interested in getting your Jeep into next year's calendar.